Panorama of Lucca from the Torre Guinigi. Lucca is a city in the Italian region of Tuscany. The city is on the river Serchio in a very fertile plain near the Tyrrhenian Sea. It is the capital city of the Province of Lucca. Lucca was founded by the Etruscans. It later became a Roman village in 180 BC. The Romans built an amphitheatre that is still seen in the Piazza dell'Anfiteatro. Lucca was an important city and fortress even in the 6th century, when Narses attacked it over and over again for several months in 553. 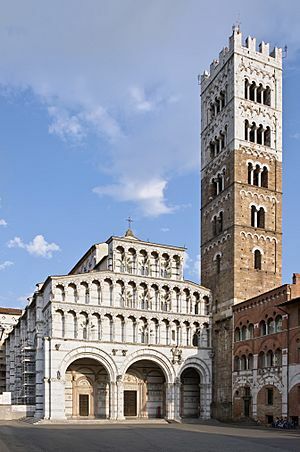 During the 10th and 11th centuries, Lucca was the capital of the feudal territories of Tuscany, with more power about the Roman Emperor. After the death of Matilda of Tuscany, the city began an independent commune. For almost 500 years, Lucca remained an independent republic. There were many minor communes in the region between southern Liguria and northern Tuscany (which was filled by the Malaspina). Tuscany in this time was part of feudal Europe. Dante’s Divine Comedy was written to remember the days spent in his exile in Lucca. In 1273 and again in 1277, Lucca was ruled by a Guelph (captain of the people) named Luchetto Gattilusio. 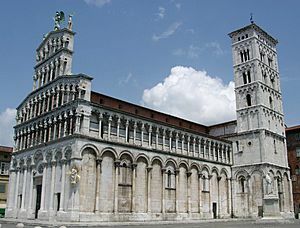 In 1314, after internal problems Uguccione della Faggiuola of Pisa make himself lord of Lucca. The people of the city made him leave two years later and condottiere gain the leadership. In 1325, in the battle of Altopascio, Lucca soldiers defeated Florence's Guelphs with the help of Castracani, a leader of the city in time of war. After they won, Castracani was named "Duke of Lucca" by Louis IV the Bavarian. 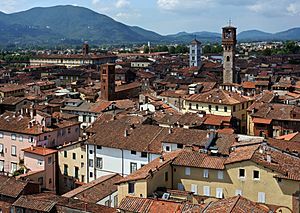 Until the French Revolution in 1789, Lucca was independent from Venice and Genoa. It was a city controlled by democracy or sometimes by oligarchy. 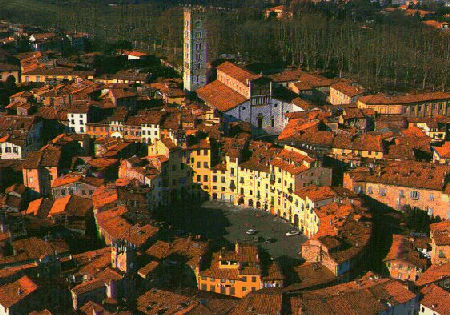 Lucca was the second largest Italian city-state (after Venice) with a republican constitution ("comune"). In 1805 Lucca was taken over by Napoleon, who put his sister Elisa Bonaparte Baciocchi in the place reserved for the "Queen of Etruria". The city became a part of Tuscany in 1847 and later a part of Italy. Duomo di San Martino (the Cathedral). The walls around the old town are intact as the city grew and became more modern. This is unusual for cities in the region. A famous place is the house where Puccini was born. The house is open to the public. Every year in Lucca there are two important festivals. The Lucca Summer Festival is a rock music festival. "Lucca Comics and Games" is the largest meeting about comics and games of Italy. Lucca Facts for Kids. Kiddle Encyclopedia.